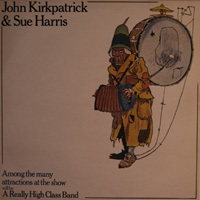 A hugely popular act on the British folk scene, John Kirkpatrick and Sue Harris, made a series of fine records for the Topic label. John had also recorded with Ashley Hutchings’ Morris On band and with Richard Thompson; both were founder members of the Albion Country Band and John would later join Steeleye Span. Their duo records are cherished by aficionados of the finest English country music from the mid-20th century revival.